An outlandish spa might be just what your bathroom needs. Oh, the bathroom. What a delightful little room. And whether it's your sanctuary or just a place to do your business, we at DVICE think this is cause for celebration. So go on, get your bathroom gadget fix this holiday season…maybe with a high-tech whirlpool tub or a robot toilet paper dispenser. That's right, the DVICE Gift Guide is back to inspire your gift-giving with the very best ideas for that geeky someone in your life. And today, it's all about bathrooms. What better way to relax after a long day at work than with a planetarium for your bath? 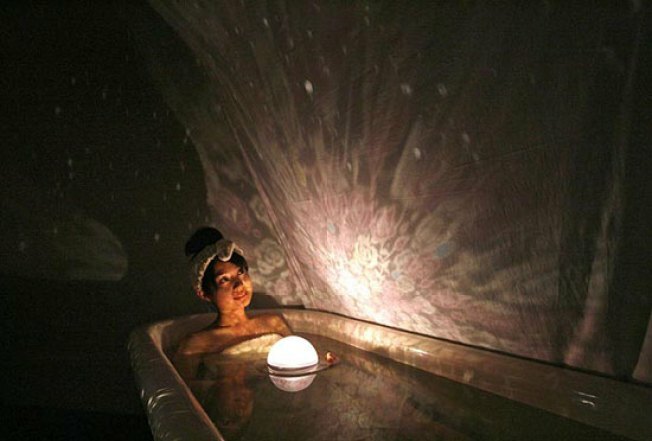 This waterproof design floats in the tub while projecting images of stars all over your wall. You can also switch between Rose Bath and Deep Ocean water graphics to change up the mood. When no other bath will do, this one has it all: massage jets, hydrojets and a chromotherapy system. This means 512 different colors choices to create the most calming, custom bath experience ever. The ultimate luxury purchase for your bathroom, one soak in this tub and you'll never go back to showers. For those of us who have fought and lost against those stubborn toothpaste tubes, the struggle is over! This simple little gadget makes sure every last bit of toothpaste gets out of the tube and onto your toothbrush where it belongs. And at this price, we think it makes the perfect stocking stuffer. Surprise your houseguests (and family) with this robot toilet paper holder. Just turn the knob on the side and, voila! Toilet paper. Available in a variety of colors, this little guy can fit in with any décor. He may be sticking his tongue out now, but we're guessing you will have the last laugh. Have you ever had a great idea in the shower or thought of another item to add to that ever-expanding to-do list? Did you forget it because you had absolutely nowhere to write it down? I'll take that as a yes. Well, AquaNotes has what you need: waterproof notepads for a more productive bath time. Alsons knows showers. In fact, they know showers so well that they added a couple things you probably don't have at home. First, they look cool. Second, they have waaaaay more spray holes, allowing for a much, much better shower experience. This one has a whopping 158 spray holes, and mine? About 40.